She’s been a little bit cheeky has that Robyn – getting us all fired up over a three EP set over the course of the year – ‘Body Talk Pt.1’ kicked us off with the brilliant single ‘Dancing On My Own’, then we had the stellar ‘Body Talk Pt.2’ which coined the awesome single ‘Hang With Me’. So here were were innocently awaiting the arrival of ‘Body Talk Pt.3’ when whammo! No – you’re not getting it. You’re instead going to get a full album that has some parts of ‘Pt.1’ and some parts of ‘Pt.2’ and some entirely new parts as well. So what do we do now with the good bits of ‘Pt.1’ and ‘Pt.2’ on the EPs we’ve already purchased? Are we to simply dig out the trusty school compass and etch those parts of the CD surface away like they never existed? Are we to just burn the parts that didn’t make their way onto the album onto a blank disc and throw the rest away? Clearly not, but we were secretly wanting a ‘Pt.3’ EP to complete our colourful little collection. 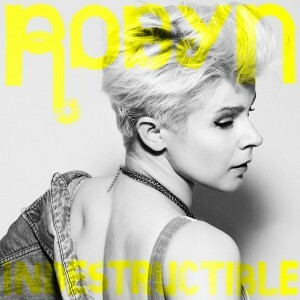 ‘Indestructible’ is set for a digital release in Australia on Friday November 12. Apparently, at least according to some German online retailers (including Amazon), there will be a ‘BT Part 3’, following the release of the almalgam ‘Body Talk’. The date I’ve seen for ‘BT Part 3’ is the 3rd of December, but whether it gets released in Aus is still a big Q.